Translation: "Down with apartheid - Campaign for the Resistance" Towards the end of the 1980s, the two major national anti-apartheid groups in the Netherlands, Anti-Apartheids Beweging Nederland (AABN) and Komitee Zuidelijk Afrika (KZA), organized co-ordinated fund raising and information campaigns involving numerous local committees and other organizations. 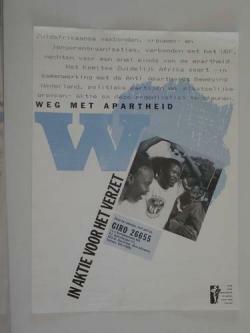 This poster went with a KZA-produced exhibition of nine posters, accompanying the Spring 1988 campaign entitled 'Down with Apartheid ? Campaign for the Resistance.' Among the beneficiaries of the campaign were a number of selected trade union initiatives and women?s and youth organizations linked to the UDF that ?fight for a quick end to apartheid?, as well as South African and Namibian media that suffered from censorship. Design: Christa Jesse. Printed by Meboprint, Amsterdam. This item was digitized by the International Institute of Social History in the Netherlands, which made it available to the African Activist Archive.